On the 3 February 1992 I was a very lost foreigner, very new to Japan. I'd landed a few weeks before and was living in Osaka, not speaking a word of the language in a city of eight million people, not many of whom spoke English. Non-Japanese were so rare of the ground that little kids would run up and tap me, running away laughing that they'd touched a foreigner. Indeed once an entire school class lined up on a train to ask for my autograph as they'd never met a foreigner in their lives before. 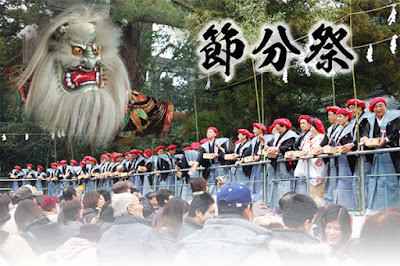 But February 3rd is a special day in the Japanese calendar; known as setsubun-no-hi it was the last day of winter in the Chinese calendar before the adoption of the western style in the early days of the Meiji Restoration. And it was the day to drive the evil spirits out of the house. Spring cleaning as it were. In a ceremony known as mamemaki, families would throw beans out of the doors or windows, shouting at the devils to get out and to call good luck in. And on that day my Japanese boss brought me a small package and a note from his wife. Her English wasn't great but she'd obviously taken the time and effort to write the short transcript for me, explaining what I needed to do. The package contained a handful of beans and when I got home that night, I threw them out of the window not really understanding why. And life started to get better after that. Thank you Mrs Gorokawa, today I still remember your kindness and the good luck you brought me all those years ago. My son is seventeen and my Japanese wife is beautiful.